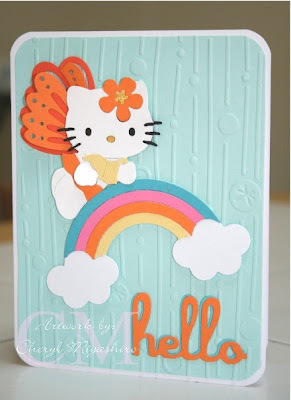 My husband has a bunch of the Hello Kitty rainbow dies and asked me to make something with it. I think it's cute and I'll probably use it on a scrapbook page for one of our many trips we take. I made the card on Wednesday but didn't get to finish it until last night since I'm working on some other things. I know the orange color on this looks pretty bright but it really isn't. I tried toning it down but when I did that, it made the rest of the card look faded. I really need to learn how to use photoshop. The word "hello" is acutally layered. I cut the hello out in blue and then in orange. You can't really see it unless you look real close. I love playing with this butterfly kitty die. It's so cute and I like how you can make the wings pop up. 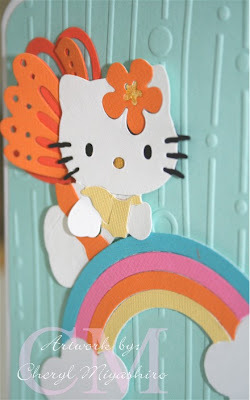 Sizzix Hello Kitty butterfly sizzlit, Sizzix rainbow sizzlet, Sizzix embossing folder, and Hello Kitty word, phrase deco strip die. Cute card, Cheryl. I especially like the Sizzix background you used - must be new. As always, another CUTE card! It's adorable, girl!! Love them die cuts!!! Thanks for sharing! this is so cute! just love the rainbow!